After some encouragement from VK3PF, Peter, I decided to activate Mount Skene VK3 VE 031. 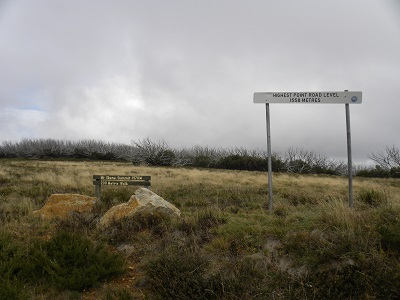 We left Bairnsdale at 08:00 and arrived at Mount Skene at about 12:00 noon. We enjoyed the drive. Licola is pretty much as we remembered it. The road is gravel a few kilometres after leaving Licola and returns to a sealed tarmac just before Jamieson. 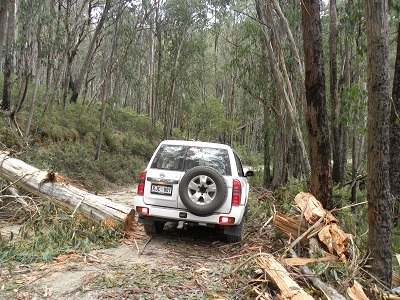 We saw only four vehicles on the road after Licola. There are a few pot holes and the usual corrugations on corners. The road is two-wheel drive capable providing care is taken. Travelling slowly and picking your path is the key to success. Some kind person had recently cleared a break through a fallen tree. It is an easy summit. You only have to walk from the parking area to the summit and carry your gear about 200 metres. The trig point is in great condition and make sure you read the plaque under the trig point. The altitude is given as 1551 metres. The old track is just visible, but if you look for two large rocks put in place by the authorities to stop vehicles going off road, you will see the track. After setting up at the summit, 13 contacts were enjoyed. I am really appreciative of those who gave me a call, given that most of the regulars were probably back at work. The first contact was at 02:17 UTC and the last at 02:58. 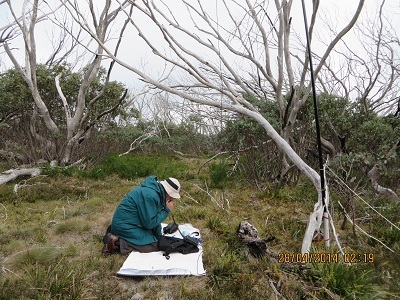 At 02:17 I worked VK3FQSO, Amanda; VK3YN, Mark at Bendigo; VK2JNG/P2, Gerard QRP; VK3UH, Ken; VK2IO, Gerard; VK2AMI, Ross; VK5HS, Ivan; VK2UH, Andrew; VK3AFW, Ron; VK1MBE, Andrew; VK5LY, Larry; VK3XD, John and at 02:58, VK3YN, Mark. 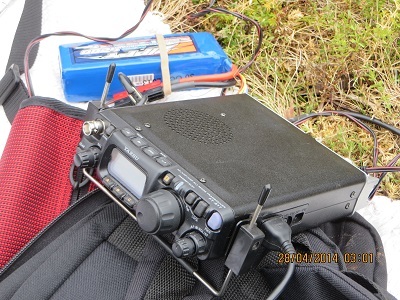 The first picture shows me kneeling on a rug and operating the FT817. While I had my rain coat on and there were a few spots it was not really cold. My nine metre squid pole is inserted into a tube and tied to a stump. Power for the five watt radio was supplied from a 4.2 amp hour LiFePO4 four cell battery.